Glazing loses a significant amount of heat from a building, so this is an area which should be monitored carefully to ensure its efficiency when insulating a property. In the case of replacement windows in both domestic and non-domestic situations, there is an alternative way of complying. Compliance can be achieved by installing a double-glazed unit with a centre pane (glass only) U-value of not worse than 1.2 W/m²K. The frame material type and its thermal performance are then irrelevant. What is the U-value that windows need to meet? The U-value to be achieved by windows, doors and rooflights refers to the energy effeciency of the frame and the double-glazed unit combined. The average area standard U-values depend on the frame material of the windows, doors and rooflights. However, when designing buildings, architects and designers have the option of 'trading off' between the insulation performance of different building materials. This flexibility allows for lower performance in a particular material to be compensated by a higher performance in another. What is the effect of the frame material? The material your frames are fabricated from will have an effect on the combined performance of a window. PVC-U and timber are generally good insulators whereas metal frames tend to be less energy effecient. 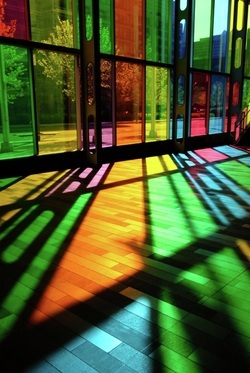 is the most commonly used architectural glass. As it is not heat-treated and therefore not subject to distortion typically produced during glass tempering, it has good surface flatness. On the downside, annealed glass breaks into sharp, dangerous shards. has at least twice the strength and resistance to breakage from wind loads or thermal stresses as annealed glass.It is a heat-treated glass products, heated and quenched in such a way to create residual surface compression in the glass. The surface compression gives the glass generally higher resistance to breakage than annealed glass. The necessary heat treatment generally results in some distortion compared to annealed glass. Like annealed glass, heat-strengthened glass can break into large shards. 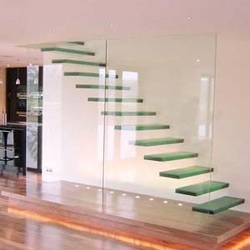 is also a heat-treated glass product, fully-tempered glass provides at least four times the strength of annealed glass, which gives it superior resistance to glass breakage. Similar to heat-strengthened glass, the heat-treatment generally results in some distortion. If it breaks, fully-tempered glass breaks into many small fragments, which makes it suitable as safety glazing under certain conditions. consists of two or more lites* of glass adhered together with a plastic interlayer. Because it can prevent the fall-out of dangerous glass shards following fracture, it is often used as safety glazing and as overhead glazing in skylights. The plastic interlayer also provides protection from ultraviolet rays and attenuates vibration, which gives laminated glass good acoustical characteristics. Because laminated glass has good energy absorption characteristics, it is also a critical component of protective glazing, such as blast and bullet-resistant glazing assemblies. See Building Envelope Design Resource Page Blast Safety for more information. is covered with reflective or low-emissivity (low-E) coatings. 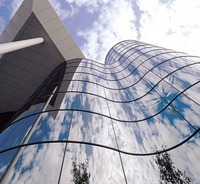 In addition to providing aesthetic appeal, the coatings improve the thermal performance of the glass by reflecting visible light and infrared radiation. contains minerals that color the glass uniformly through its thickness and promote absorption of visible light and infrared radiation. 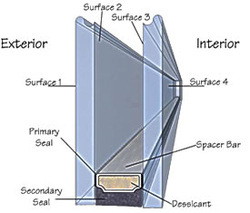 A section through insulated glass. 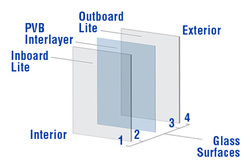 units (ig units) consists of two or more lites of glass with a continuous spacer that encloses a sealed air space. The spacer typically contains a desiccant that dehydrates the sealed air space. The air space reduces heat gain and loss, as well as sound transmission, which gives the ig unit superior thermal performance and acoustical characteristics compared to single glazing. Most commercial windows, curtain walls, and skylights contain ig units. Most perimeter seals consist of a combination of non-curing (typically butyl) primary seal and cured (frequently silicone) secondary seal. the quality of the desiccant. It is a glass which has a thermally enhanced coating designed to reflect heat back into buildings, therefore reducing energy wastage. Thermal Performance (Conduction, Solar Radiation, Thermal Break, Comfort) Glass and glazing selection play a key role in determining the overall building's thermal performance. Fenestration thermal performance requirements must be integrated with the design of the building's heating and cooling systems. Single glazing has poor thermal performance and is suitable only for applications where thermal performance is irrelevant, such as interior applications or installations where interior and exterior temperatures do not vary substantially. 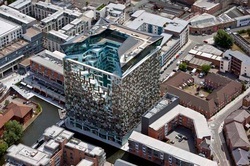 -The vast majority of architectural glazing consists of ig units. 5.The configuration of the spacer around the perimeter of the unit. 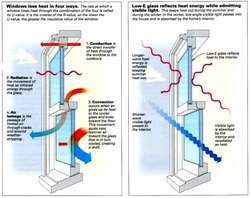 - Low-emissivity (low-E coatings) limit heat gain through the glazing by reflecting heat energy. 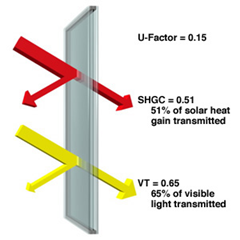 -Reflective coatings reduce interior solar heat gain by reflecting solar energy. -Thermal conductance:b is a measure of air-to-air heat transmission due to thermal conductance and the difference between indoor and outdoor temperature. -Conductance is expressed in terms of U-value. 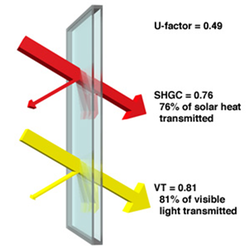 A lower U-value indicates reduced heat transfer through the glass. Thermal modeling of specific fenestration assemblies using computer programs such as THERM allow estimation of total U-values for fenestration assemblies and help predict thermal performance. Moisture Protection (Water Penetration, Condensation Resistance) Since glass itself is impervious to water penetration, glazing waterproofing performance is determined by the glazing method chosen (e.g. wet glazing versus dry glazing) and drainage details of the framing system. Wet glazing most commonly consists of a gunable ("wet") sealant installed over a preformed tape or gasket. 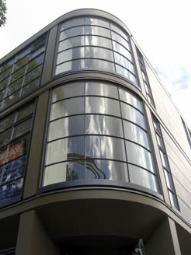 Dry glazing systems utilize extruded rubber gaskets as the glazing seals. This system is also referred to as compression gasket glazing because the system relies on compression of the glazing gasket to seal against air infiltration and water penetration. The systems are sometimes mixed, most commonly with exterior wet glazing and interior dry glazing. Condensation occurs if the temperature of interior frame or glazing surfaces falls below the dew point temperature for the interior air. · providing supplemental heat to the glazing to increase surface temperatures. the air sealed space layers adds extra insulation to the building. If heat absorbing tinted glass or heat reflective glass is used, the load on the cooling system will be greatly reduced. high insulation properties adds comfort. reduces solar heat radiation also reducing glare. Therefore providing a pleasant interior working and living environment. Double glazing units has a good sound reduction capacity. It's especially effective if different glass thickness is used in the double glazing units combination so that the glass will not resonate simultaneously at their critical frequency. With single glazing, dew condensation will occur when there is a large temperature difference between the outside and inside of a room. But with double glazing units, the good insulation of the air layer prevent the glass from becoming cold and consequently harder for dew to condense on the glass surface. How can the thermal performance of the double-glazed unit be improved? Double glazed windows can insulate the home and they are also sealed, which means that heating cannot escape through gaps between the window and the sash. This means that you will need much less electricity to keep your home warm and cozy in winter. On top of this the reduction in heating uses means that you are being kinder to the environment as well and reducing your household carbon footprint. It’s the club sandwich of window design. While double glazing consists of two layers of glass with an air gap between them, triple glazing gives you three layers of glass and two air gaps. Just as with double glazing, the glass can be treated to make it more energy efficient, and the air gap can be filled with an inert gas such as argon, to help to reduce the heat loss. Changing to triple glazing Why? Triple glazing is widely used in cold climate countries like Sweden and Norway, and the ultra-lowenergy PassivHaus standard requires triple glazed windows with a Uvalue of no more than 0.8. To get a window with such a low U-value, you have to not only switch to triple glazing but also insulate the frame itself, as well as using more expensive manufacturing techniques — the gas krypton tends to be used, instead of argon. Wall Ratio Of Glazing Percentage. A window to wall ratio is the measure of the percentage area of a building’s exterior envelope that is made up of glazing, such as windows. Since windows are generally the lowest performing part of the building, old-world thinking was that windows should either be small or few to maintain building energy efficiency. And given that most windows are R-3.0 or less, that would be true. However, windows can be larger and more numerous if their thermal performance (R-value) is higher. The heart of the matter is that if you use a standard dual pane window system with thermally broken aluminum framing, you have a system that is about R=1.4. And in no case should you have more than 30% window area, and even then, most of your energy is being lost through the windows. A high performance traditional window system (R=2.8) would limit yourself to a 45% window area maximum. If you install a high performance R=7 system or better, add glazing to your heart’s content. Regional codes will allow you to use about a 70% glazing ratio for the cleanest, most modern look. Of course for any final assessment, the building should have a full energy model, but keep a simple chart like this handy to set basic expectations and maximize energy efficiency early in the design process. 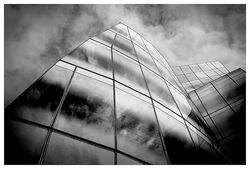 “Can Fully Glazed Curtainwalls Be Green?” by John Straube.